23 States participated. 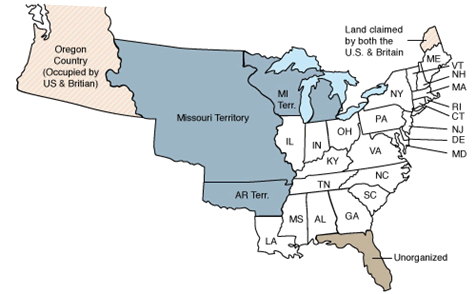 New States in 1820 census include Alabama, Mississippi, Illinois, Indiana, Louisiana, and Maine. The territories of Arkansas, Michigan, and Missouri also participated. It took approximately $209,000 and 1,188 enumerators to complete the 1820 census, producing 288 total pages in published reports. The U.S. population increased by 33.1 percent from the 1810 census to the 1820 census. What was lost from the 1820 U.S. Census? The 1820 census records for New Jersey, Arkansas Territory, Missouri Territory were completely lost or destroyed. Alabama and Tennessee also lost parts of their census records for many individual counties. 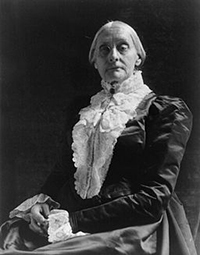 Born February 15, 1820 in Massachusetts, Susan B. Anthony became involved with the both the anti-slavery, or abolitionist, movement and the women's suffrage movement. Anthony pushed for women's right to vote and co-founded the National Woman Suffrage Association. Susan B. Anthony began her activism in the 1840s, holding abolitionist meetings at her family farm in New York with Frederick Douglass, another famous figure in the struggle to end slavery. Anthony was also an impassioned fighter for women's right to vote right until she died in 1906 at the age of 86. Sadly, she did not live to see women achieve voting rights that followed the passage of the 19th Amendment in 1920. August 4, 1821: The Saturday Evening Post is published for the first time as a weekly newspaper. December 20, 1820: Missouri imposes a $1 bachelor tax on unmarried men between the ages 21 and 50. November 26, 1825: The first college social fraternity, Kappa Alpha, is formed at Union College, Schenectady, New York.